Spider-Man has already done plenty than just reinvigorating the superhero and comic book genre in the video game industry. In addition to pleasing fans worldwide, the exceptional take by Insomniac Games has primed Sony to eventually register a century for the number of units sold by the PlayStation 4. Besides the fact that Spider-Man has proven to be a system seller, the web-crawler has also been fairly busy in keeping the surprisingly detailed Manhattan setting safe from supervillains. The following is a personal ranking of all the boss fights incurred in the narrative, from the very best to worst. Take heed that there are possible spoilers below and anyone still playing should probably return at a later time. There being a mysterious antagonist was always teased from the start and it is not until the half-way point that Doctor Octopus is finally revealed from behind the curtain. The kind and pleasant Octavius was himself there during the first hours but his gradual fall toward the dark side is what makes the final battle so intense. In contrast to just hiding his villainous identity, the doctor actually believes that he is saving mankind through his research. Hence, he does not even realize that he has become a villain in his pursuit for justice. As for the fight itself, it is undoubtedly the most visually stunning from the lot, brawling across rooftops to the side of skyscrapers just like in the source materials. What makes this confrontation spectacular is how both of his twin personalities are given due prominence. The narration itself takes over for the kind-hearted Martin Li and switches for the evil Mister Negative in a seeming tribute to Alan Wake. There is also another homage in the script that refers to the train rescue sequence from the Spider-Man 2 movie, starring Tobey Maguire. Hence, it is just not the Darkforce that makes the fight against Mister Negative special and one to hold above all others. In contrast to the previous villainous duo, Scorpion and Rhino actually work together to make things a bit difficult for Spider-Man. The hulking behemoth needs to be led toward objects in the vicinity, all while trying to dodge venomous projectiles from the stinger. This does mean that both will jump in together from time to time and Spider-Man will have to choose his openings very carefully. The best way to win this fight is by showing persistence. In terms of difficulty, the Shocker is a pretty easy nut to crack. While his battle suit can easily send Spider-Man reeling with concussive shock waves and pressurized wind beams, the entire fight is more attuned to be wary of the environment than the attacks themselves. If anything, the Kingpin offers more phases to go through. The only reason why the Shocker lands higher is because the fight accentuates how beautifully and gracefully the web-crawler can swing across the terrain, something that Insomniac Games cannot be praised enough for. Just keep swinging around like an unleashed Ferris wheel until an opening presents itself. Prepare to redirect loose rubble and then jump in to land a few blows before quickly getting out of the way. This supervillain is clearly only capable enough to open up safe boxes with his destructive powers. You would think that going up against two supervillains would make Spider-Man sweat but as it turns out, the “super” prefix needs to be adjusted in this instance. Electro feels more like a race than an actual boss sequence. When he does stop to retaliate, destroying a nearby generator finishes the fight without much effort. This tags in Vulture from the skies but even he does little to make it interesting for Spider-Man. It really appears that Insomniac Games was just too exhausted at this point to give the two a bit of an edge over the web-crawler. In another optional instance, Spider-Man must take down Tombstone without getting smashed in the process. For once, no amount of sticky webbing or flying rubble is going to do the job. Tombstone is just too strong for that and the only way to weaken him is to force him to breath a cure, which is ironic because Tombstone is said to be unable to breath (like a zombie) in the comic books. This can prove to be a messy fight because the initial focus is to take out the reinforcements, some of which are even riding bikes into the abandoned warehouse. Secondly, the latter phase finds Tombstone wielding a fiery winch that threatens to burn down the entire area. The change of pace and scenery is highly appreciated. The only real challenge here is collecting enough tokens to pit Spider-Man against the Taskmaster. He is a damage soaking sponge at best, which is disappointing when considering the time and patience required to unlocking this fight throughout the progression. The short series of attack moves do not even require Spider-Man to swing for cover. Mere traditional dodging before going all in works fine against the Taskmaster. The powerful crime boss is the first one to tangle with Spider-Man and considering his fearful status in the Marvel Universe, it is actually disappointing that he puts up such little resistance before being webbed into a Christmas gift for the police. For starters, the turrets at the beginning can be taken out easily without sustaining any damage. 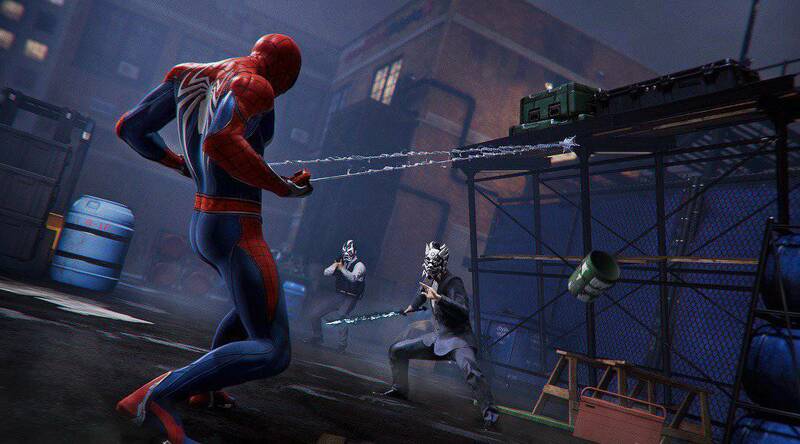 The Kingpin only joins the fray afterwards and a little webbing is all that is needed to land a few blows before rinsing and repeating the same combat sequence. The only thing to look out for is him charging in like an angry bull. Dodge that singular attack and the entire fight becomes a button-prompt event. Insomniac Games could have given the Kingpin the respect he deserves. There is no way that he would go down so easily in a traditional comic book arc. Which boss fight did you find to be the most pleasing? Let us know in the comments below. Spider-Man is now available exclusively for the PlayStation 4. It has received stellar reviews from critics and is already the fastest selling game of the year within the first week.